In 2014, 16 German states abolished tuition fees for undergraduate students at all public German universities. German universities have an excellent reputation worldwide, due to the difficulty of the study programs and the emphasis on research projects. The state provides funding for research projects, thus enabling students to conduct relevant research and learn from actual real-life situations. Universities in Germany are open to students from all over the world, and as such, Germany is presently one of the most popular destinations for international students. Currently, there are 250,000 international students at German universities. 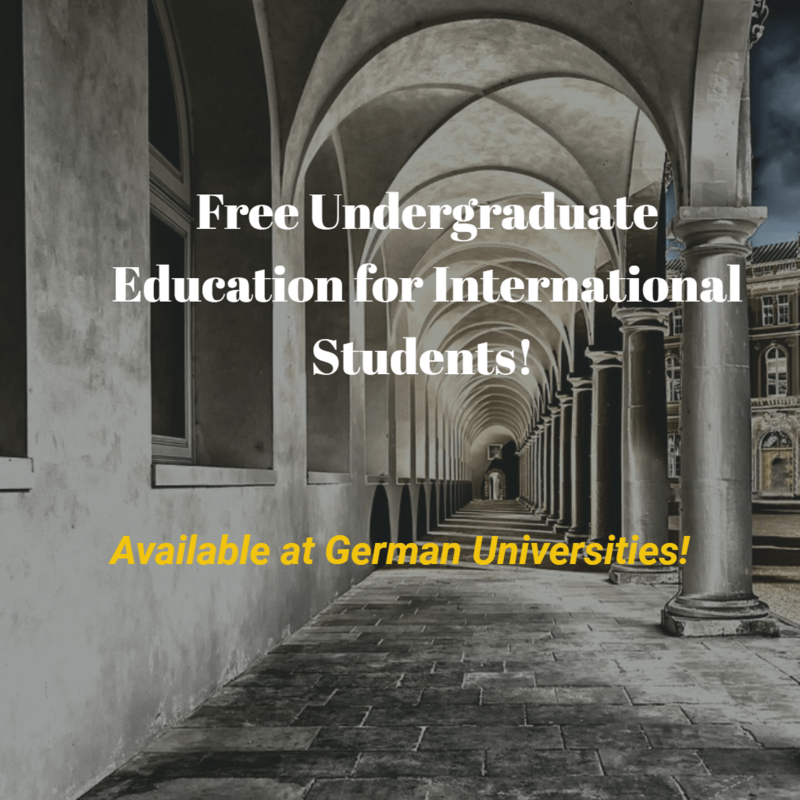 International undergraduate students at public universities in Germany can study for free with just a small fee to cover administration and other semester costs. Although students enrolled in German public universities do not pay tuition fees, they have to find a way to fund their living expenses. On average, one needs at least €850 per month to cover accommodation, transport, food and miscellaneous expenses. Housing is the greatest expense for the international student, as it includes utilities and internet access. Health insurance at an average cost of €960 should also be factored into one’s budget. The cost of living forces many international students to look for jobs to pay their bills. As such, a student must be careful to maintain the delicate balance between work and study. The cost of living in Germany is considerably less than in other European Union countries. Also, costs differ depending on which state you choose to study in. Proof of funds is a key requirement for getting a student visa. You must prove that you have enough money to support yourself while in Germany. Every student should have a minimum of €8700 in his or her bank account for the whole year. These funds are proof that you can finance your studies if the need arises. You will need to get a document called “Finanzierungsnachweis” – proof of financial resources – before you apply for an entry visa. International students can choose to study at any of the 380 public universities in Germany. At present, the courses readily available for international applicants include Engineering, Humanities, Linguistic and Cultural Studies, Computer Science, Economics and Human Medicine (only in some universities). Students who wish to enroll for Masters Programs are eligible for admission only if their previous studies are in the same area as the Master course. Some students may find that their previous studies do not match Germany’s academic system. In this case, the student must sign up for a one-year pre-Bachelor or pre-Master course at a local university before proceeding with his or her studies. There is a broad range of English-taught programs as well as German-taught programs, all in diverse academic fields. Note that when you apply for a visa and a residence permit, you must demonstrate that you have sufficient funds to finance your training in Germany (as indicated above). When making your application, make sure that you apply for the correct visa. In addition, your passport must be valid for your entire stay in Germany. Student Visa – issued to students who have received notification of admission to a university or a foundation course. If your study program is going to last longer than 90 days, and you are not a citizen of an EU member state, you must apply for an extended residence permit at the Alien Registration Office in your university town. To be admitted to a study course you must have sufficient knowledge of the German language. The DSH and the Test DaF are the recognized qualifications (certificates) for German language assessment. If your knowledge of German is below par, you will need to take a preparatory course at the university during the semester breaks to improve your skills. All students are however be expected to have attained a certain proficiency level right from the beginning. You can prove that you have attained this level by presenting a certificate issued for passing a DSH or TestDaF exam (after approximately 400 to 600 class hours). The DSH is taken at the local university (courses are not free) in Germany, while the Test DaF is taken in any country. The Test DaF exams take place six times a year. German is however not a prerequisite for international degree programs and special postgraduate courses. Here is an example of one of the universities offering tuition-free undergraduate courses. Rhine-Waal University has two campuses as Kleve and Kamp-Lintfort. This university prides itself in excellent research and teaching, as well as a strong network of international partnerships with research institutions and industries. The enrolment fees total about €290 per semester. These cover administration fees, and a public transport ticket valid for the entire state. The university also provides other funding opportunities that include merit-based scholarships. Applications to Rhine-Waal University are made through Uni-assist. When the application period begins, open the Uni-assist online application portal and select Kleve or Kamp-Lintfort (campuses of Rhine-Waal University). You can then upload and submit your documents. Pay the Uni-assist processing fee to complete the application process. You can monitor the status of your application through your Uni-assist account. Note: All these documents can be certified by the German diplomatic mission in your home country.